Hailed by some as one of the best games of 2013, Don’t Starve follows Wilson, a scientist who only has a magic beard going for him. One night after gaining some forbidden knowledge from his radio, Wilson is transported to another world. This game is one filled with survival and magic – it’s one you shouldn’t miss! This week’s Video Game Fashion will be consist of three different looks inspired by the wacky characters from this mystical adventure. Wilson is a scientist and the main protagonist of the game. His power comes from his beard, which helps him survive. Wilson used to live in a small house, working on experiments all day, however, after an encounter with some forbidden knowledge, he is transported to a strange world. His outfit consists of a red vest, a white button-up, and black shoes and pants. The only standout piece is his vest. Willow is a young woman suffering from Pyromania, and her special power is that she’s immune to fire damage. 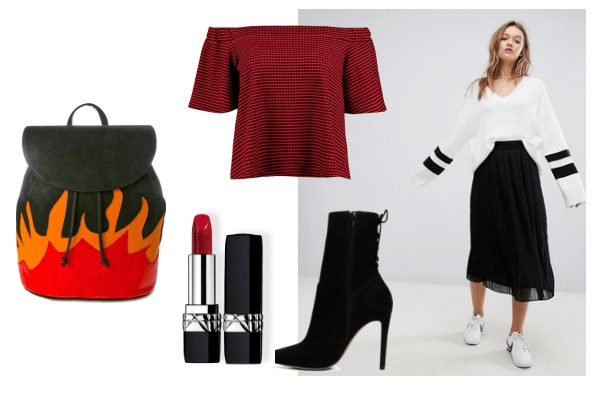 Willow wears a long black skirt and a red shirt, which I used as inspiration for this outfit. For a unique take on Willow’s look, I paired an off-the-shoulder gingham top with a frilly midi skirt. Willow is a dramatic, theatrical young woman, so I also added some tall, heeled boots for drama. Throw on a flame-embroidered backpack and rock a bright red lip for even more of a fiery effect. Wendy is another one of our playable characters and she’s also quite morbid, relating everything to death. She can summon her deceased twin sister, Abigail at a whim. While death is her only conversation topic, she’s as cute as can be with a bright red headband, red skirt, white shoes, and striped tights. I mixed up Wendy’s look to create a more practical outfit. Keeping up with the red theme, I paired a bright red headband and red scalloped skirt. A white cable knit sweater and light, cognac booties keep things warm and cozy. 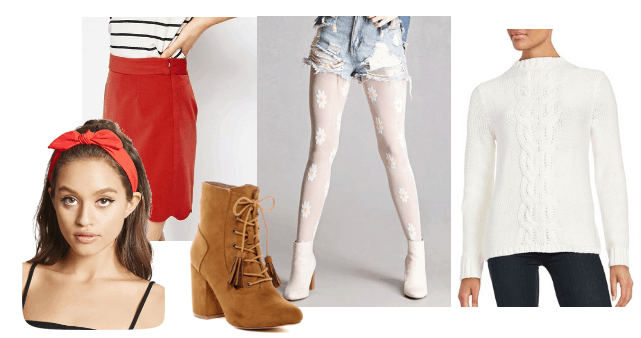 To top everything off, I couldn’t resist adding some white, sheer daisy tights — after all, Abigail is summoned by a flower. How did you like Don’t Starve? Was it fun, confusing or do you agree that it was one of the best games of 2013? Also, who is your favorite character to play as? Let me know in the comments!